One of the primary benefits of an electronic pipette is increasing productivity in the lab. Scientists have a limited amount of time to spend in the lab each day, and any advantage that can reduce the amount of time spent pipetting and free up that time for other tasks is beneficial. Further to this, certain protocol steps require reagents to be added to reaction wells across a 96 well plate quickly while maintaining accuracy. An electronic pipette can be of huge benefit to scientists in these situations. Did you also know some electronic pipettes can be programmed to follow your protocol? For example, you can program some of these pipettes to aspirate and dispense 500 µL, followed by 750 µL and 1000 µL. There is a lot of discussion about ergonomics these days. From office chairs and desk heights to how to lift heavy objects; people have become more aware of how important ergonomics is to overall wellbeing. In science, Repetitive Strain Injury (RSI) is the hot topic when it comes to ergonomics. Scientists can develop thumb, wrist, or shoulder pain after pipetting for long periods of time. Switching to an electronic pipette greatly reduces scientists’ risk of RSI, due to improved ergonomic shape and design, and reduced thump activity during prolonged and repeated pipetting. Although many electronic pipettes were traditionally heavier than their mechanical counterparts, Advances in plastics and batteries enable some designs to be extremely light, such as the Oxford Lab Products BenchMate E.
Due to the digital display and motor operation, you can be confident that your electronic pipette will dispense the volume you have selected accurately and reproducibly. This is hugely important for the reproducibility of experiments and the accuracy of your result, which is dependent on constant and consistent pipetting force. Having most of the pipetting process automated by using electronic pipette likely reduces the possibility of human error. User to user variability is also removed from equation if scientists are using the same settings, meaning that data and results become more reproducibly. Many of today’s electric pipettes have extremely easy to use interfaces for an effortless and intuitive user experience. 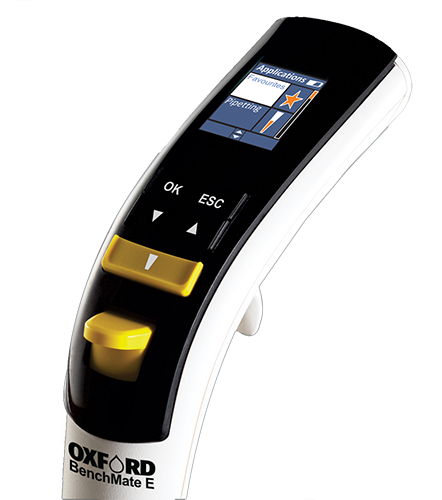 Examples of these interfaces include the easy to use- graphic interface on the Oxford LP BenchMate E Electronic Pipettes, the user-friendly dial on the Eppendorf Xplorer plus Electronic Pipette and the intuitive menu on Sartorius Picus Electronic Pipette. The multitude of features available in an electronic pipette help to greatly increase efficiency and ease of use. Most come in both single and multichannel formats. They have multiple pipetting modes including multi-dispensing, pipetting, reverse pipetting, mixing, diluting, and even allow users to save their favorite programs for quick and easy selection. Many electronic pipettes now have charger stands available. Meaning that your pipette is charging while you are not using it, ensuring that you never run out of battery and enjoy uninterrupted usage, just as you would with a manual pipette. 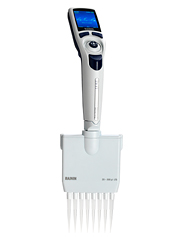 Sartorius Picus Electronic Pipette is the smallest and lightest electronic pipette on the market. The eLINE Single and Multichannel Electronic Pipettes dispense liquids twice as fast as a mechanical pipette, and are designed with built-in error control. The new Eppendorf Xplorer electronic pipette was specially designed for high professional standards to provide optimal support for you in your research. 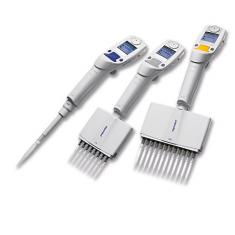 The Eppendorf Xplorer Electronic Multichannel Pipette was specifically designed to deliver highly professional standards to provide optimal support for you in your lab work. 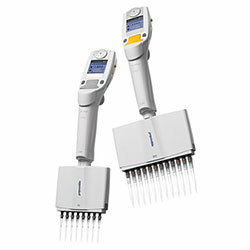 The Eppendorf Xplorer Electronic Multichannel Pipette has an intuitive operating concept and design based on the proven Eppendorf PhysioCare Concept. Designed based on the proven Eppendorf PhysioCare Concept the Xplorer Plus redefines the electronic pipette line from Eppendorf. Product features include; reduced weight, programming of multiple modes in sequence, the setting of fixed volumes, password protection, history function and service interval warning. 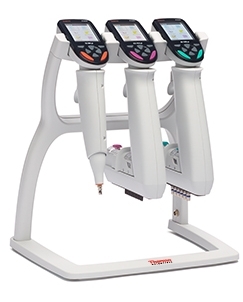 The Research pro is the only electronic pipette where Ergonomic handling and operation was the top priority during the entire development process. Perform sample transfers between virtually any tube, rack, microplate or horizontal gel box quickly and efficiently with the Thermo Scientific™ E1-ClipTip™ Equalizer Pipette. Adjustable tip spacing allows you to set the distance between tips by simply sliding the scale to expand or contract to the desired labware format. Impact2 multichannel pipettes allow you to utilize the power of electronic pipetting in microplate formats. In addition to an ergonomic design, Impact2 pipettes feature step-based programming that allows you to perform pipetting routines that would either be cumbersome or even impossible with manual pipettors. 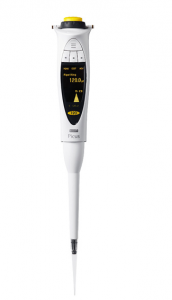 Proline Electronic Single-Channel Pipettors cover wide volume ranges for more applications with fewer instruments (e.g. 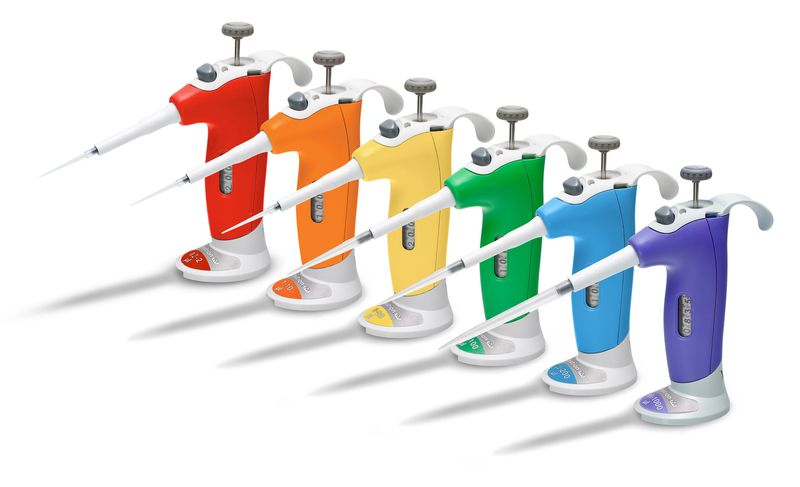 BPE 50-1200 µl), has 5 aspiration and dispensing speeds for use with different sample viscosities, with the help of feather-touch piston action and whole-hand tip ejector it prevents Work Related Upper Limb Disorders (WRULDs). 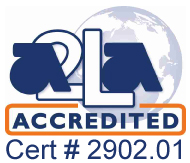 The BrandTech Transferpette Electronic Single Channel Pipette is independently certified ergonomic and user-friendly by an OSHA-accredited lab. 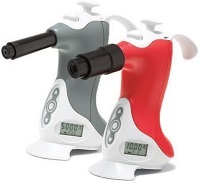 It is an accurate, ergonomic, motorized instrument that is simple to use. The new BRAND Transferpette-8/-12 electronic pipettes are also independently certified ergonomic and user-friendly by an OSHA-accredited lab. Ovation electronic single channel models are the ideal choice for anyone needing a broad menu of automated liquid handling functions. Includes Ovation Power Supply unit to recharge the pipette's battery. The macro Ovation pipette allows convenient aspiration from tubes, flasks and bottles. A relaxed grip design, low weight, and electronic operations make repetitive pipetting effortless, even over prolonged periods. Sterile and filtered graduated tips are available in various packaging including our new recyclable VistaClear Box. Both the 8 and 12 channel models of the Vista Lab Ovation Electronic Multichannel Pipette are available for precision liquid handling from 0.5 uL to 1250 uL. The Vista Lab Ovation Electronic Multichannel Pipette is a high-quality product. 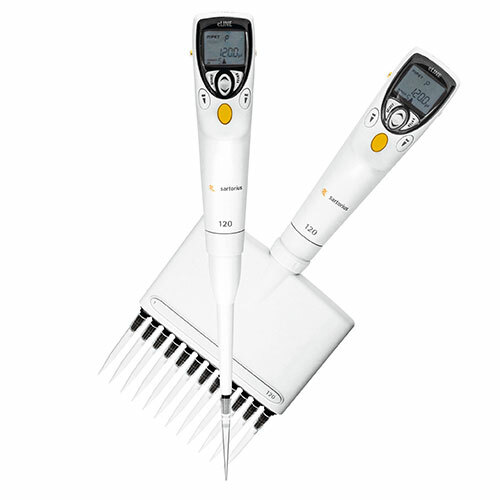 Fully electronic and ergonomic, this multichannel pipette is ideal for any lab. The Labnet Excel Electronic Pipette is a multifunctional unit with various operational modes for standard and reverse pipetting as well as multiple and sequential pipetting, mixing of samples and serial dilutions. 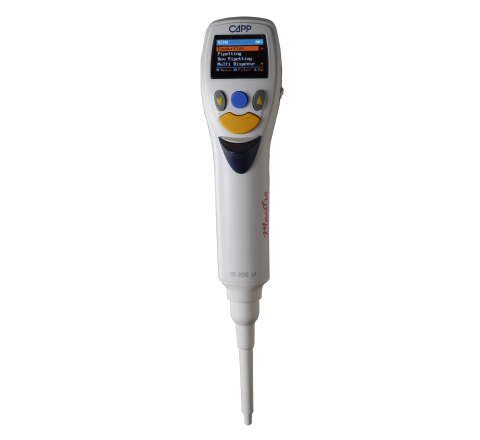 All functional options of the Labnet Excel Electronic Pipette are easily programmed with one hand on the well positioned display and keypad. 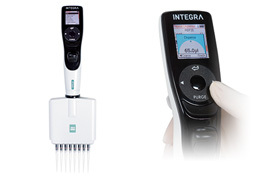 Integra ViaFlo electronic pipettes increase productivity with a menu driven user interface, versatile pipetting modes, and unique tip fitting design. You may also be interested in our selection of Tubes, Pipette Tips and Vortex Mixers. Find out more about RSI here. 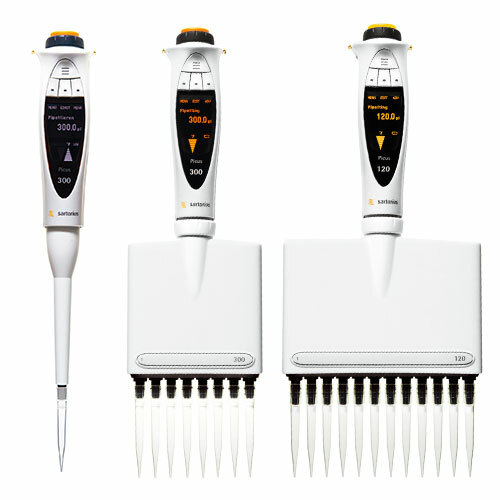 Learn how an Electronic Multichannel Pipette can benefit your lab here. New customers receive 10% OFF calibration service, including Electronic Pipette Calibration Service with Pipette.com. Pipette.com offers a complete line of pipette tips.